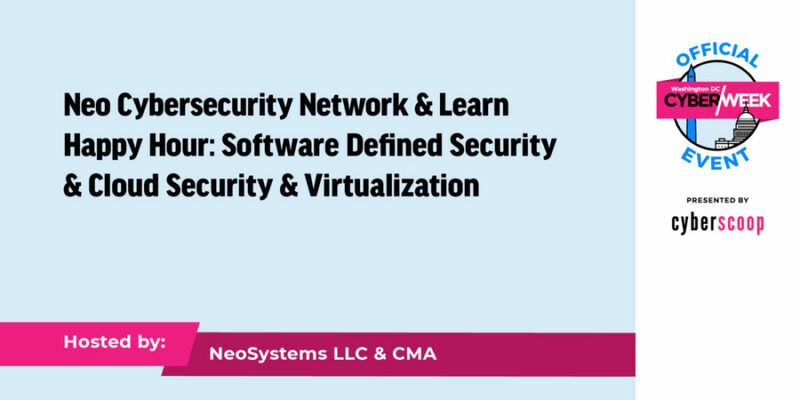 This networking “social hour” event, hosted by NeoSystems and CMA and featuring a reception catered by The Capital Grille, includes presentations from distinguished cyber security leaders. You’ll hear from industry-leading disrupters in the software space who will discuss trending Software Defined Security (SDS), a security model that is implemented, controlled and managed strictly by software, and we’ll also provide an update on Cloud Security and Virtualization. The SDS presentation will cover a highly adapted, policy-driven and governed security practice, where most of the security controls such as intrusion detection, network segmentation and access controls are automated and monitored through software. The Cloud Security and Virtualization presentation will cover recent developments in software defined networking (SDN) that show great potential to virtualize data networks in the same way that operating systems have been virtualized, and will speak to trends and how these industry developments will shape the future for government contracting in the cloud.